While others predicted when oil from the Deepwater Horizon spill in the Gulf of Mexico might reach beaches, ocean modelers at Los Alamos National Laboratory and the National Center for Atmospheric Research asked when gushing oil might exit the Gulf, where it would go and how diluted it'd be, up to a year later. 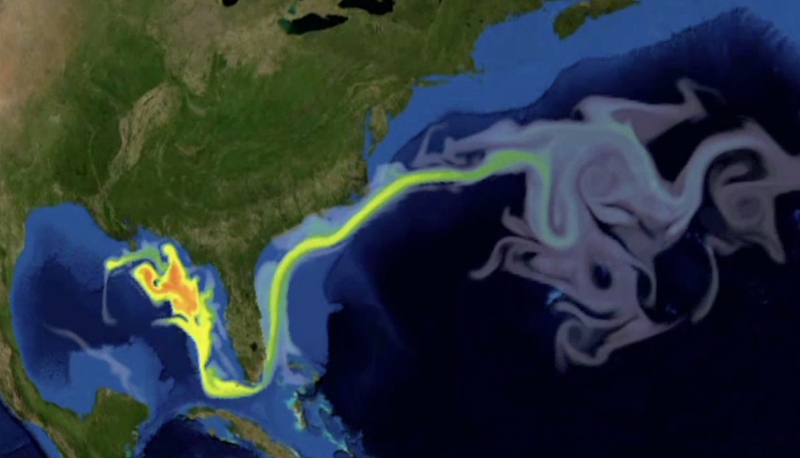 A frame from an animation showing the possible route into the Atlantic Ocean of oil and dispersant from the spot of the Deepwater Horizon spill in the Gulf of Mexico. Within days of the Deepwater Horizon oil well blowout on April 20, 2010, Los Alamos National Laboratory (LANL) oceanographer Mathew Maltrud, working at the New Mexico Supercomputing Applications Center, ran a simulation of the spilled oil and sent a visualization to collaborator Synte Peacock of the National Center for Atmospheric Research (NCAR). Maltrud and Peacock had been studying – and continue to study – ocean dynamics and the relationship between the ocean, climate, the environment and Earth’s atmosphere. All of the gushing oil was at once fascinating and fearful, and it piqued their curiosity. About the same time, the two heard from Peacock’s former Ph.D. adviser and occasional collaborator Martin Visbeck, who lives in Germany. Visbeck mentioned that a low-grade panic was sweeping parts of Europe, where citizens began to fear the oil might someday pollute their coasts. With visions of the Alaskan Exxon Valdez spill still fresh after 20 years, many were wondering when Gulf oil might reach their continent and how diluted might it be. Visbeck told his German colleagues of his friends who had a global model that might provide some answers. Suddenly, real-time events were driving science at a frantic pace. The U.S. Department of Energy allotted Maltrud generous computing hours on the Jaguar Cray XT system at Oak Ridge National Laboratory’s Leadership Computing Facility. He began exhaustive weeks programming a series of ensembles, each a varied group of simulations in which a certain parameter is changed. In this case, the only variant was the ocean’s initial state. The researchers sought to answer a riveting question: What were the chances that oil, exuding at a rate ranging from an estimated 1,000 barrels a day in April to upward of 62,000 barrels a day in August, would escape the Gulf and lurch up the Atlantic Seaboard and beyond to the coasts of Europe? Meanwhile, other models were capturing world attention because they used real-time data and monitored the situation the way weather is forecast. Businesses, tourists, governments, environmentalists – all wanted to know the spill’s effect on local beaches, on ocean flora and fauna, and on seafood safety. “We sought a different approach,” Maltrud says. “We didn’t try to make predictions, but tried instead to understand statistical distributions of what’s possible because that’s the kind of thing that our model can do. Those other models tried to represent exactly what was going on in the ocean at a given time, so we figured that we would try to shed some light on how long it might take oil to leave the Gulf, where it might go, and in what relative concentrations in relation to what was being released at the spill site. The model Maltrud ran is called POP (Parallel Ocean Program). He made major contributions to its development at LANL in the ’90s; it is the ocean component of NCAR’s Community Climate System Model. The crux of the modeling problem was a Gulf feature known as the Loop Current, a complex “clockwise surface circulation” entering the Gulf through the Yucatan Channel, and exiting in the Florida Current through the Florida Straits. Maltrud calls the Loop Current the “big meander” because its behavior is akin to a river on a flood plain: now and then changing course, creating oxbow lakes and mini-currents. In the Gulf, these small currents are eddies, subsets of the major loop circulation. The eddies are complex because there may be two or three going at any given time, each broken off from the Loop Current at its own interval and moving in its own pattern.